This Week's Trip is the Tottenham-Albion Hills-Schomberg Loop, about 55 km in length. 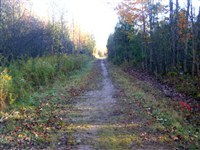 You can see it on Page 19 in the Ontario Trail Maps Flip Book - look for Loop 104. Start/ End in Tottenham on Nolan Rd. at Queen. This hilly tour takes you through the beautiful rolling landscape that includes the Albion Hills and the historic village of Schomberg. The route then takes you from Schomberg back to CR14 and west to Tottenham, where a working steam engine operates regularly for visitors on the South Simcoe Railway . Riding east out of Tottenham, Nolan Rd. becomes 5th Line which you will take until you reach 20th Siderd. Turn right (south) and when you cross Highway 9 you will be on Main St. in Schomberg. At Church St. turn right, then right again at Centre St. (now in Lloydtown), then left at Rebellion Way, then right at Little Rebel Rd., which curves westward and becomes 19th Siderd. The "rebel" references in these street names recall The Lloydtown Rebellion of 1837 - part of the Upper Canada Rebellion. During the 1830s, Lloydtown was well known as a site for reform sympathisers, and regular meetings were hosted by Jesse Lloyd. Continue on 19th Siderd. to 12th Concession and turn left (south). Just south of 18th Siderd. the road curves around a "kettle lake" , one of many in this glaciated landscape. 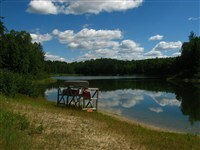 This is part of the Oak Ridges Moraine . At 17th Siderd. turn right (west). The road curves and becomes Castlederg Siderd. 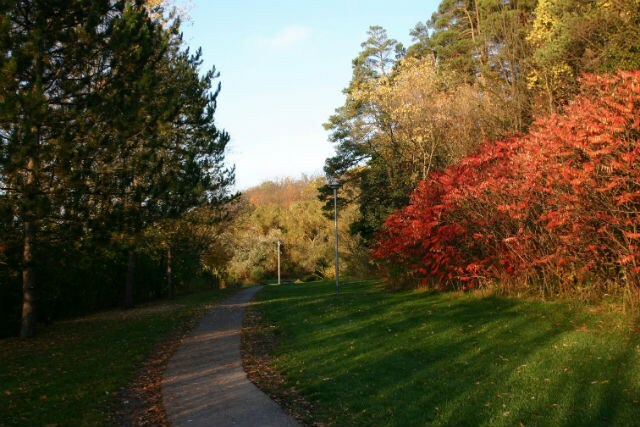 Just past Duffy's Lane you will pass the Humber River and the Humber Valley Trail . At The Gore Rd. turn right (north) and continue past the Caledon Trailway , a rail trail following the bed of the Hamilton & Northwestern Railway built the line in the 1870's, until you reach Highway 9. 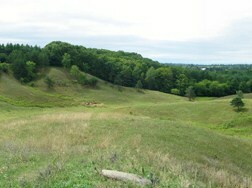 This part of the Oak Ridges Moraine is called Albion Hills. Jog slightly west on Highway 9 to the south end of Concession Rd. 3, where you will turn right (north) and continue to Siderd. 10. Turn right (east) and continue until the road ends at Regional Rd. 50, where you will jog slightly left then right onto Regional Rd. 14., which takes you back to your starting point. If you need a great place nearby to service your cycling needs, check out The Epic Ride in Orangeville. Be sure to check back in 2 weeks for the next installment of This Week's Trip!